Foxvangen's Toy Boy is a Blue Papered Missouri Foxtrotter. He is a true roan stallion standing 16 hands. In top condition he weighs 1200 lbs. He is most remarkable in producing terrific bone, joints and feet on his get as well as a fabulously gentle and intelligent brain. 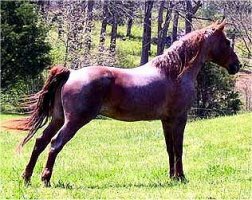 One of Toy Boy's strongest qualities as a breeding stallion of gaited horses, is his ability to moderate pace bringing the offspring to middle ground with gaits that are more diagonal. He produces quality foxtrotting and running walking foals consistently. 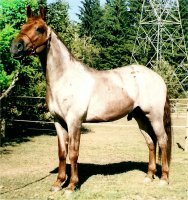 Toy Boy is a powerful horse that foxtrots, and running walks in pasture and is a natural athlete. He slide stops, rolls back and moves like a stock horse. He is also a curly horse and is hypo-allergenic. Many of his offspring are born curly and hypo-allergenic as well. Missouri Thunder F. Missouri Casey W.